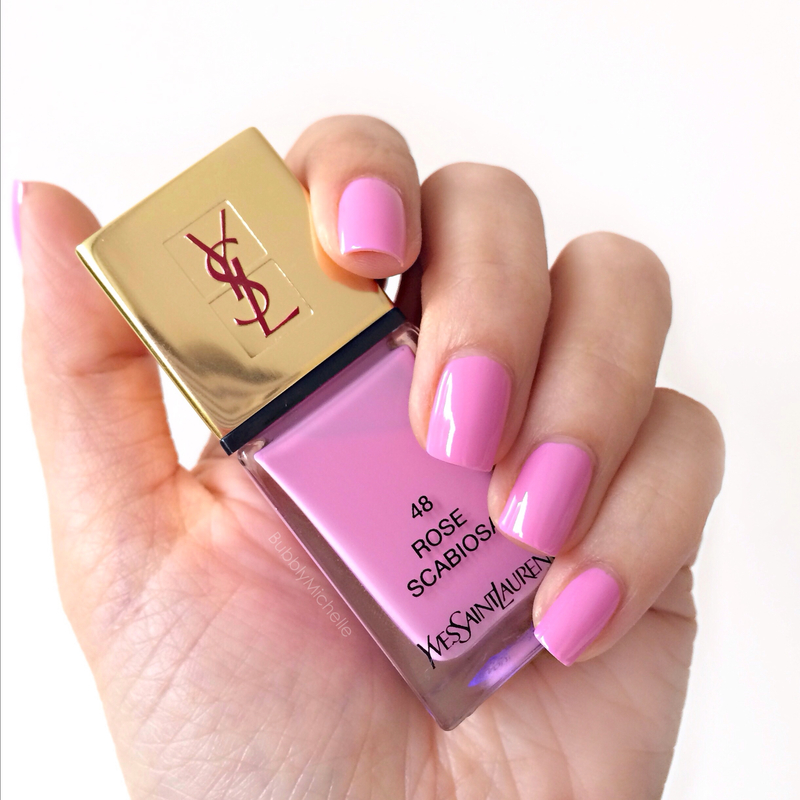 One thing YSL beauty does well is nail lacquer. I have never come across any YSL polish that ever performed poorly to be honest. Yeah, some of the lighter shades can be a bit on the sheerer side, but a couple of coats always give a nice even finish. YSL Rose Scabiosa #48 (LE) is no exception to that. I LOVE this cool toned, medium pink. I have nothing similar in my stash and was very excited to pick this up as soon as I returned home from my Christmas vacay. I achieved full opacity in two coats (applied over the usual Chanel base coat). Later on I did go over it with a top coat which brought out more of a glossy finish. But this photo was taken before the top coat to give you an idea how it looks worn all by itself. The Guerlain top coat I use extends the wear of these polishes, and also helps with keeping nail breakage to a minimum. Application wise this was a dream to paint on. The consistency not too runny or too thick, and the signature broad tapered brush allows you to cover a wider surface of the nail and gives better control of application. * The drop of polish is a true representation of the actual polish colour. These give me the best wear time, a solid week without major chipping, definitely wear longer than Chanel or Dior (Chanel being the poorest… visible tip wear within 3 days). YSL lacquer come in 10ml / 0.34 fl.oz bottles, retail at SGD 37. I purchased mine at the Ion Orchard counter, Singapore. In the US they are available at Neiman Marcus, Nordstrom and Saks. Thank you for stopping by, wishing all of you a wonderful week ahead! 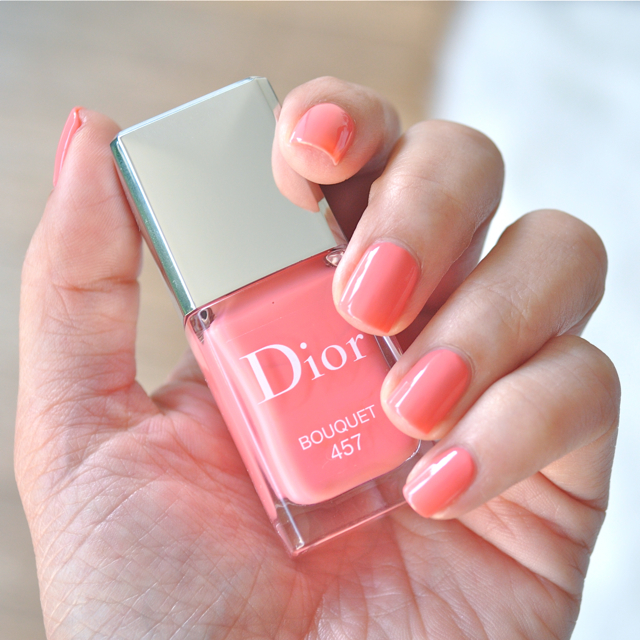 My picks for Dior Spring 2014, plus reviews and swatches. 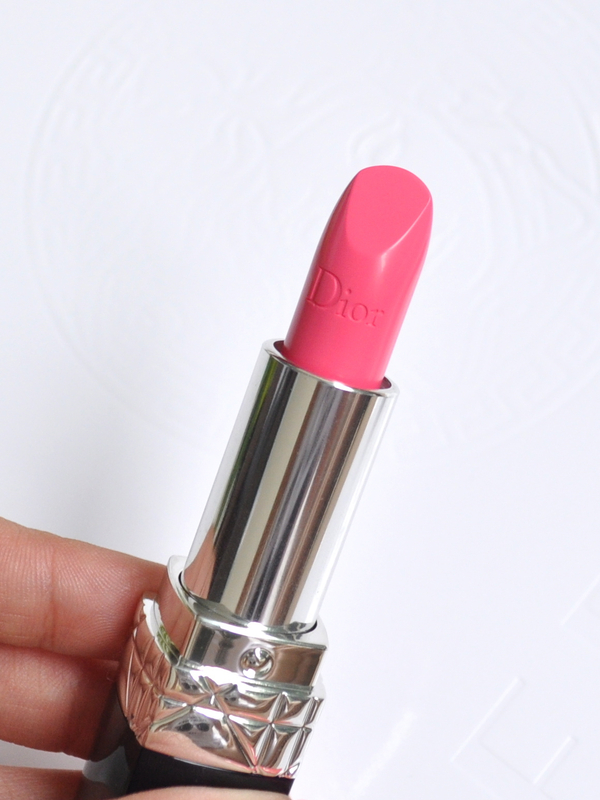 January 8, 2014 January 10, 2014 by Bubbly Michelle23 Comments on My picks for Dior Spring 2014, plus reviews and swatches. 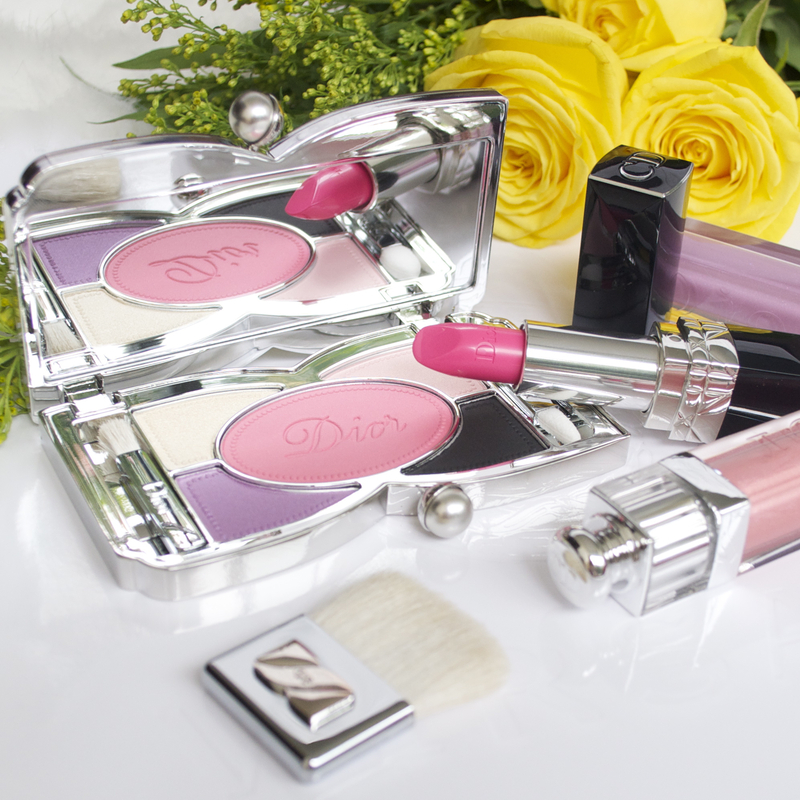 Starting off with a little overview of what Dior had on offer this Spring. 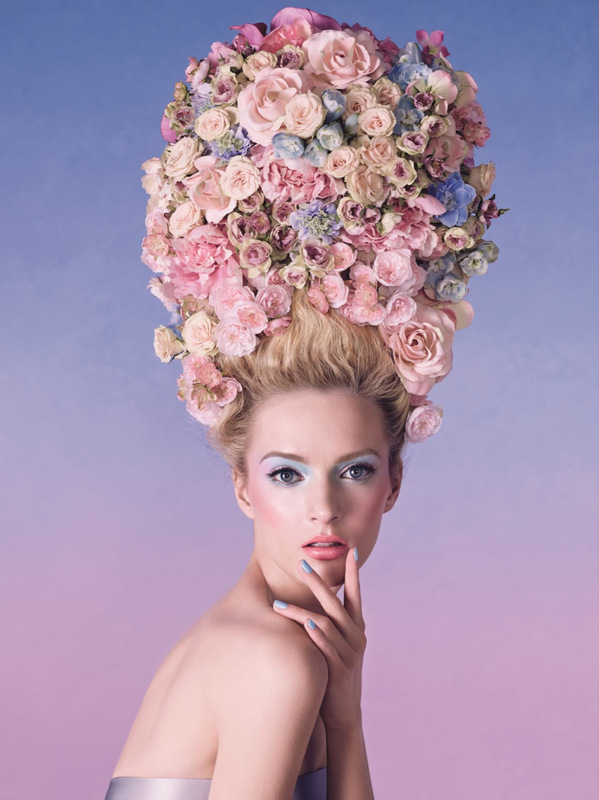 As you may have already seen (unless you were living under a rock the last month or so, or have been on a social media ban) Dior Spring 2014 was all about creating very fresh wide eyed girlie looks with soft pastels and a random burst of bright pinks. 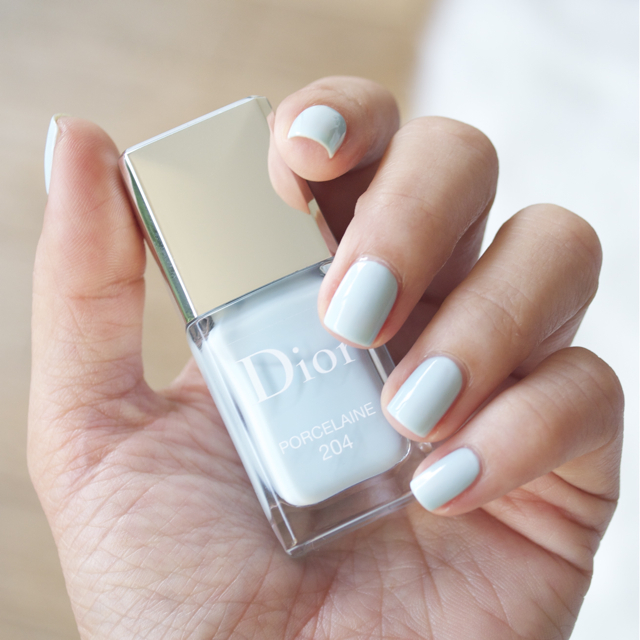 Although I know pastels for Spring isn’t really the most novel idea to come around, I just want to state that Dior did it oh so well! From the pretty pastel blues, to the lilacs to the baby pinks, I could truly find nothing to complain or whine about, except for the fact that almost all the eye quints and palettes were geared towards the fairest of the fair. However here are my picks from this collection, ideal for medium skin tones AND you fair ladies out there! My pick from the palettes was 002 Coquette. After swatching all the other palettes that were released with this collection, I found that Favourite and Coquette to be the best pigmentation wise and could be built up to true to pan swatches. 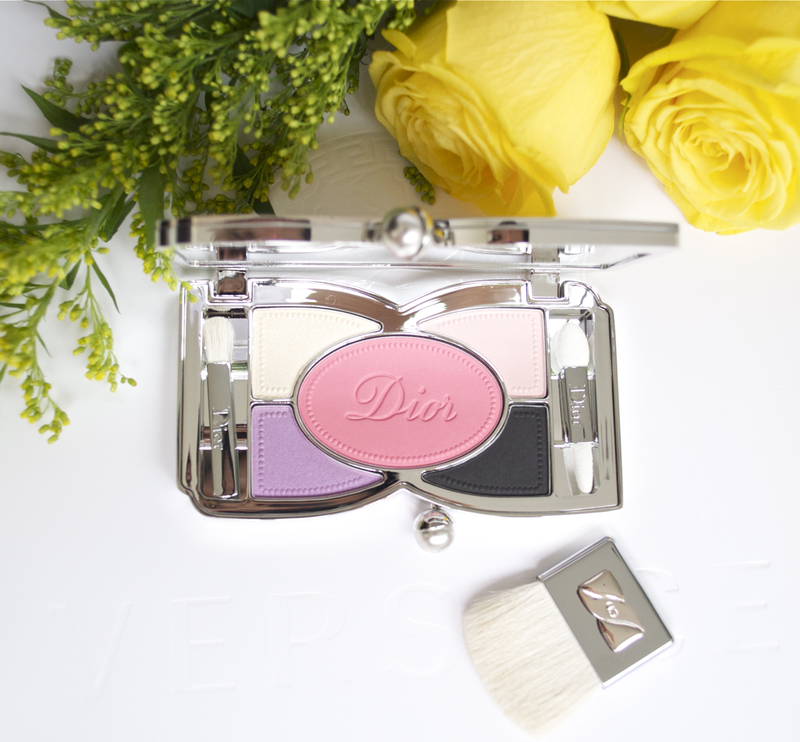 As all Dior or other high end eye palettes, this too came in a velvet sleeve and the palette was pretty heavy and felt lovely to hold (unlike light plasticy packaging most drugstore makeup is housed in). The palette also included a large mirror, two small eyeshadow applicators as well as a cute little bow handled brush that’s meant for applying the blush (although I highly doubt it would ever get used as it’s pretty scratchy). 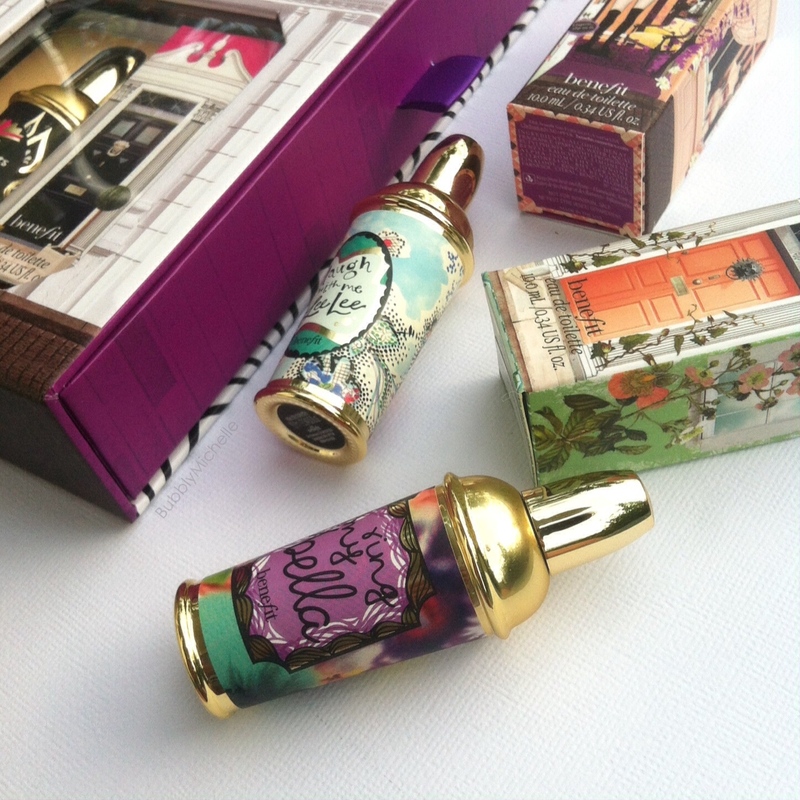 Bottom line, the packaging was exquisite… True Dior style! A soft buttery yellow – This had a high shimmer finish and almost ivory white once applied; a great highlighting shade. The texture was silky smooth and blends very easily. An iridescent lilac – Had good colour pay off and is buildable to a true to pan shade. I experienced zero fall out, and after hours n hours of wear, no creasing! Something I have consistently noticed with most Dior eyeshadows. A light baby pink – Another incredibly light shade with a satin finish. I used this as a transition colour to blend out the lilac and make it look more diffused by softening the edges. *Must note that this was of a slightly more powdery texture and a fair amount of powder got kicked up while I was applying it on the lid. Although when I smoothed it and blended it, the satin finish comes out further giving it a beautiful sheen. A sooty matte black – Perfect to use as a soft liner with this purple eye look. Sadly the pigmentation was poor and applied patchy due to it’s dryer texture. The worst performer in this palette. 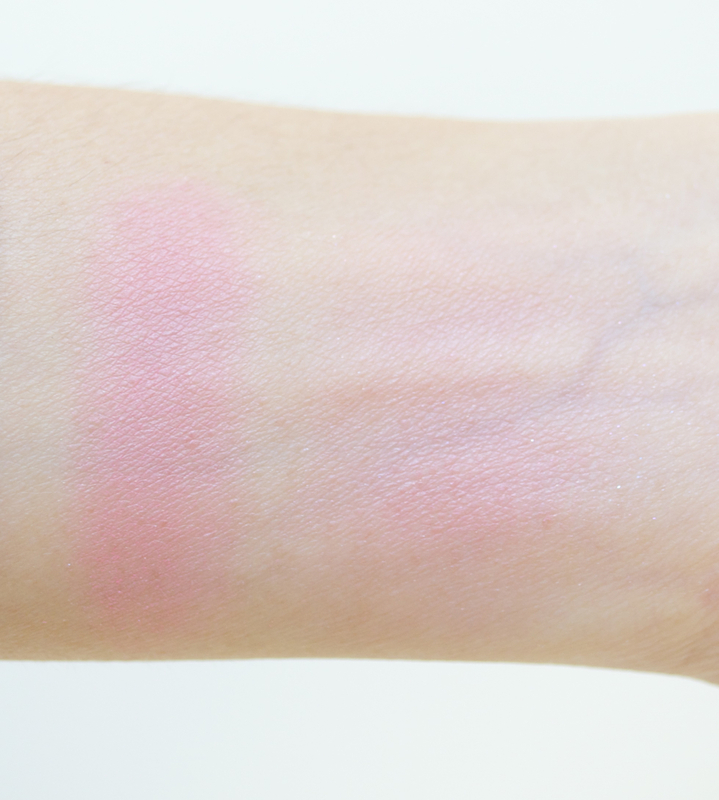 The Blush, a warm bright corally pink, perfectly compliments the eyeshadows, and although it looked intense in the pan, it blends out quite sheer without any powderyness. The final result was a very natural looking healthy, rosy flush. 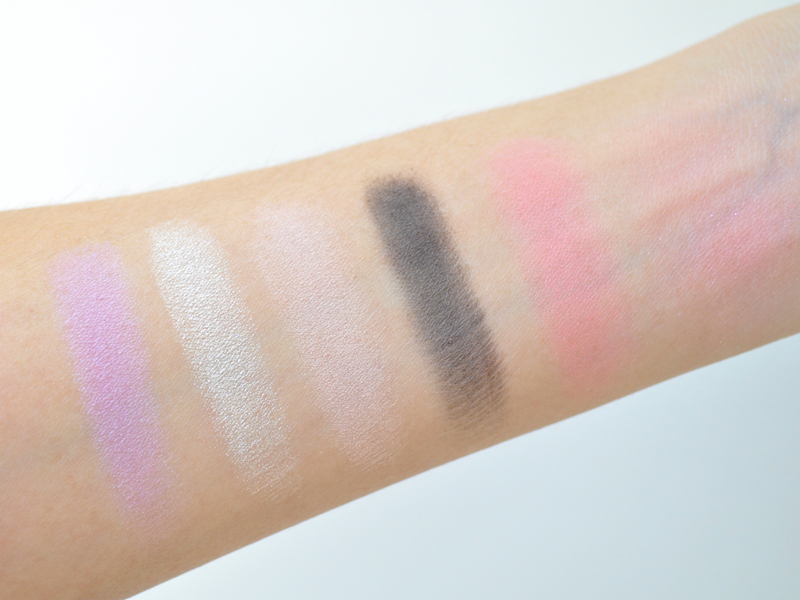 Blush swatches, heavy and sheered out. Courtisane is a cool toned pink, and looks slightly coral in the tube. But once applied it looks pretty much pink. You only need about two passes to achieve full opacity and the lipstick wears well and keeps lips moisturized. I tested out Courtisane topped with Minauderie and it wore around three hours and through a meal of Ramen after which it faded evenly and I was left with a pretty pink stain. 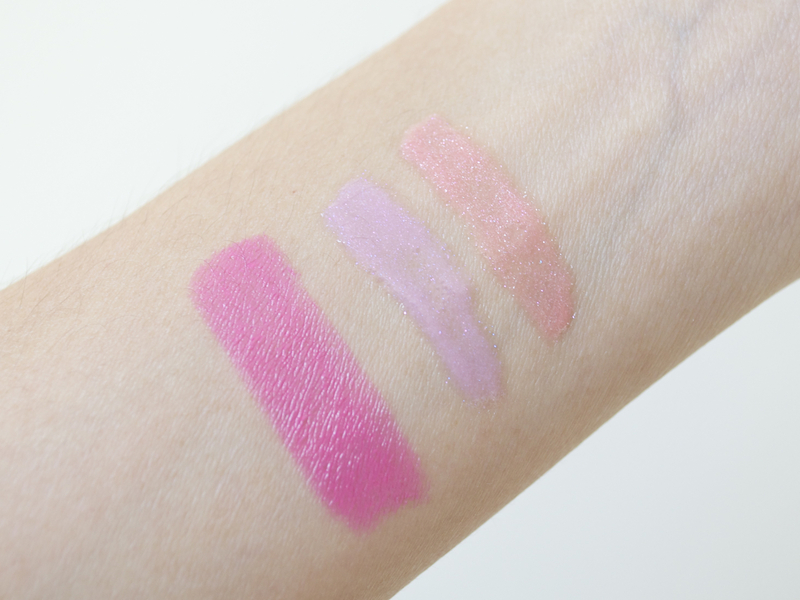 Lastly the two glosses I picked up were #382 Minauderie a cool lilac shade and #442 Petillante, a warm light peachy pink, both sheer, but what stood out was the incredible multidimensional shimmer.. it was so fine, and sparkled like diamonds! These topped over cream lipsticks or satin lipsticks, instantly plump up the lips and give the illusion of a fuller luscious pout! 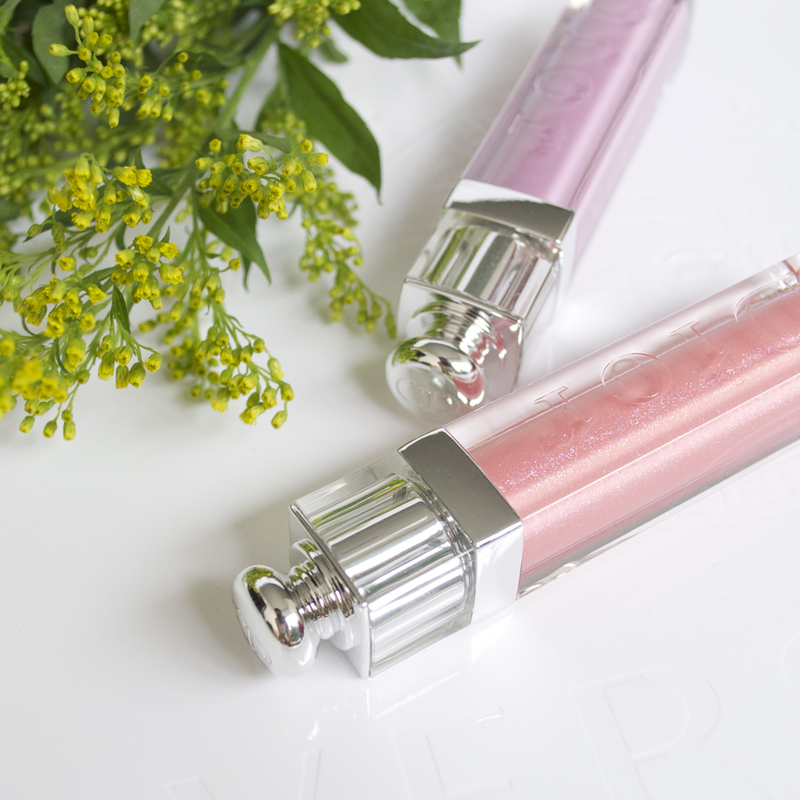 P.S- Dior lippies and glosses don’t have any detectable scent. The SA informed me that they are usually unscented, which is something I love! Personally I hate heavily scented lippies.. specially the YSL ones have an incredibly strong fragrance to them. In conclusion I felt the collection was a winner, from the gorgeous polishes to the lipsticks, very well worth your hard earned money. 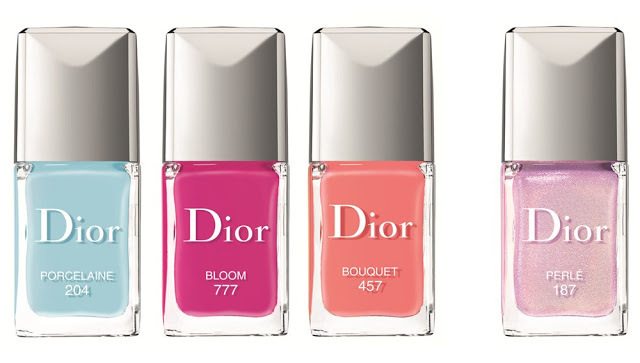 And let’s hope to see another fab collection by Dior this Summer! * for nail lacquer swatches and review, please refer my previous post! Anyone else out there that thinks Spring collections hit the counters ridiculously early this year? Like seriously!??? I bet next year they’d try sneaking it up on us well before NYE, mark my words! Like all Dior’s regular polishes, this came with the signature wide applicator brush which is great for quick and easy application. Consistency was not too runny or too thick, it was just right 🙂 ; and Porcelain applied smooth with a little streaking on the first coat (something I have come to expect with lighter cream finish colours as these) and by the second coat it looked opaque with all streaking corrected. Bouquet applied pretty much the same as Porcelain, opaque in two coats with no streakiness, and this one was a warmer shade, so I see myself using this during Summer as well! Something worth noting is that this applied much more brighter on the nails than seen in the bottle. My favourite was Porcelaine, and like last years Nymphea 307 I expect this to sell out just as fast. 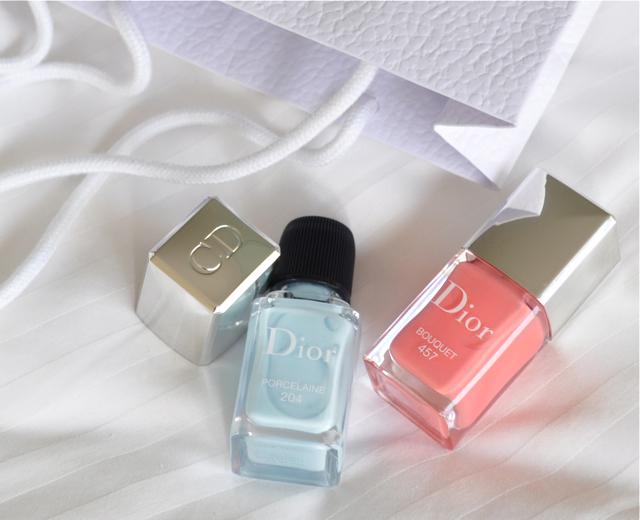 Call your nearest Dior counter and reserve it now! If you are like me and start off real early buying Christmas gifts and then are scrambling around mere days before ‘the day’ looking for stocking stuffers, this post is for you! a. Stocking stuffers should ideally be exactly what they sound like – small enough to go into a stocking! b. No need to go all extravagant (unless that’s your thing of course!) as they are just the little extras. c. The more the merrier! Don’t skimp, it’s the holidays! I personally love receiving a tonne of little gifts! d. Try to take advantage of sales and other year end deals that most stores offer. Since you’ll be buying so many gifts, overall you do save a substantial sum if you shop smart. Now on to a few stocking stuffers I managed to get my hands on, mostly from the Sephora 20% sale in Singapore. 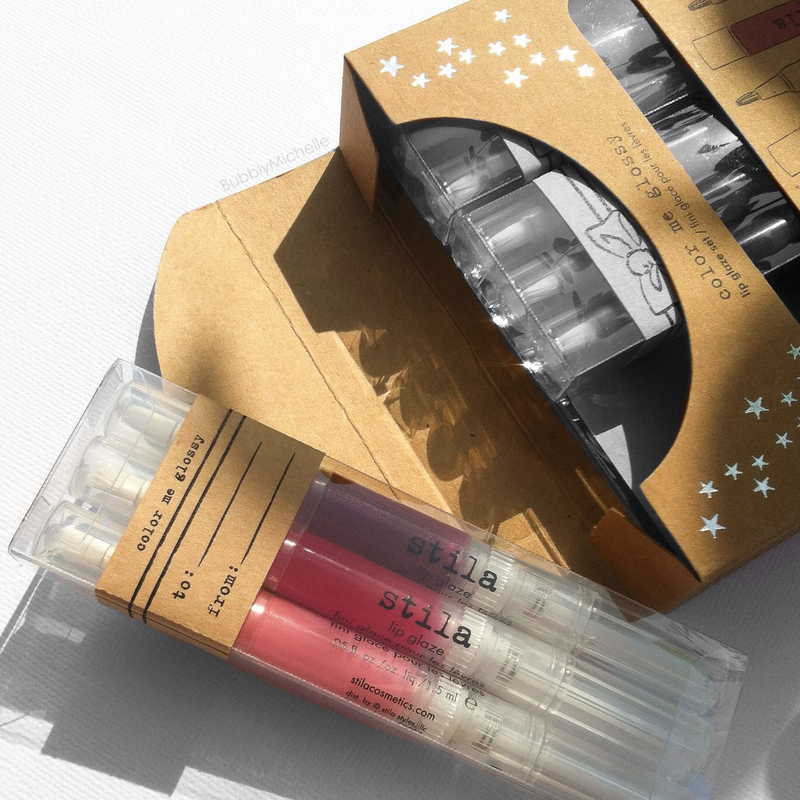 This Stila lip gloss set was made for stocking stuffing, it contains three individually packed gloss sets. There’s even a label to write recipient names! Now that’s smart marketing. 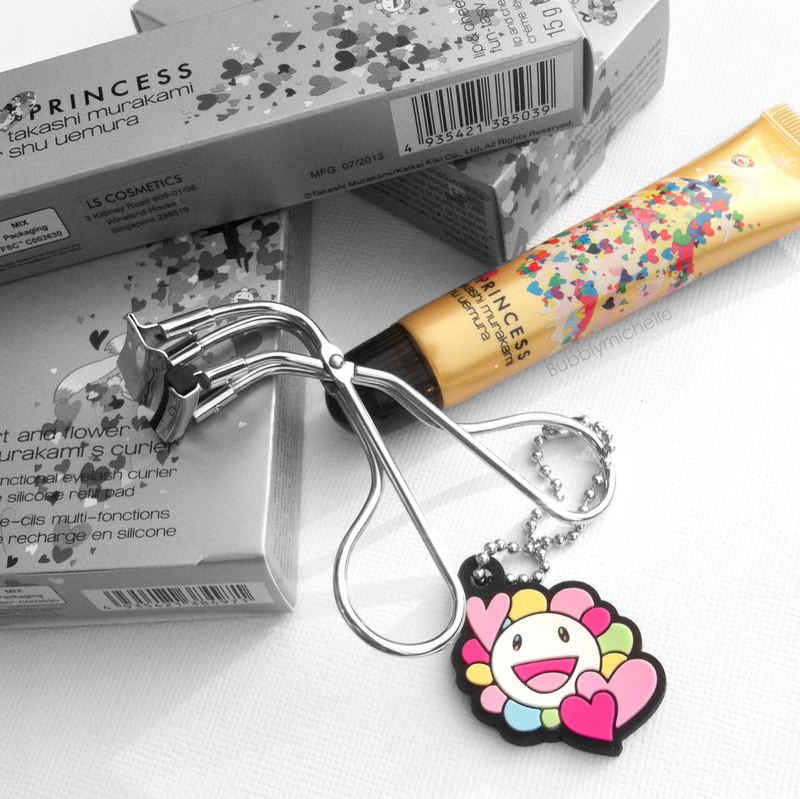 Adore this cute lash curler and lip/cheek tint from the Shu Uemura 6 Heart Princess holiday release, it’s a fun little addition to any gift pile. And it’s always a plus when the packaging is cute, or even better, Christmassy! This collections packaging is decorated with a Christmas tree of hearts! I always feel that gifts such as lipsticks can be tricky if you don’t really know a persons taste in makeup, but things like mascaras you really cant go wrong with, they only come in a very few shades and everyone is usually happy with black! 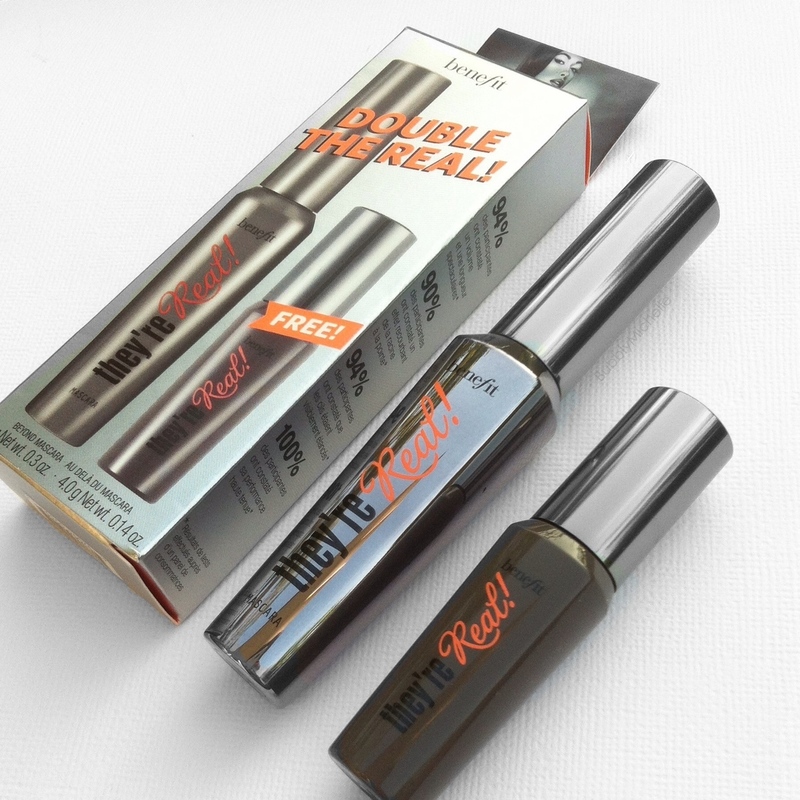 This set is extra special cos it comes with a mini mascara too, and it’s free! Perfect for anyones makeup bag. So that’s my little list of finds, hope is was of some help and eased your holiday gift shopping trauma at least a bit. 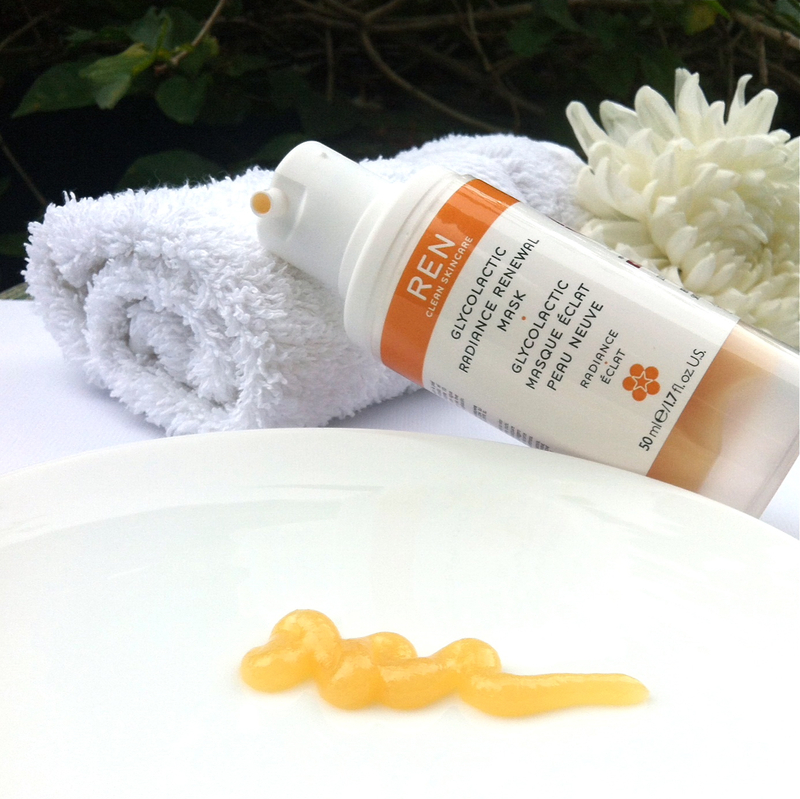 Today I will be reviewing a mask by REN, a much talked about skincare company that ‘uses only 100% plant and mineral derived actives and is free from skin-unfriendly synthetic ingredients *’ which means, No Parabens, Sulfates, Mineral oil, Silicones, artificial fragrances etc… And as a plus, this company does NOT test on animals which is something I love to see on product packaging! I picked up this mask maybe about two months ago, and the fact that it was always out of stock at my local retailer was something that got me even more excited to try it! It’s like those magical words ‘Limited Edition’ is to makeup! Ha ha! So in the mean time while I waited for new stock to arrive I tried a sample of this as well as the F10 Smooth and Renew Peel mask (intended for sensitive skin). Between the two, the Smooth and Renew mask left me so underwhelmed that I banished all thoughts of purchasing it, where as the Glycolactic Radiance Renewal mask was everything a mask should ideally be… deliver SPEEDY RESULTS! I love the no nonsense packaging of REN products, and the pump bottle is perfect as it is the most hygienic for this type of product. It also comes with a tiny little cap for the nozzle that keeps the mask fresh too. So yes, packaging gets a 10/10 from me. The product is somewhat of a thick jelly like texture that looks like fruit puree with the most amazing nectarine orangey smell! I die! And remember? no artificial fragrances! Isn’t that just awesome! Then as I glanced through the ingredients list I came across Lactic acid, Papaya extract and various other fruit extracts (which explains the smell!).. all of which are known to help peel off the dead skin cells to reveal fresh youthful skin. Upon application the mask leaves a slight tingling sensation, though not to the point where it is uncomfortable, after I left the mask on for 10 minutes I washed it off using the soft muslin cloth that came with the product, and noticed how radiant, glowy and soft my skin felt, it was actually one of those moments when you hear the heavens sing! Mind blown! The mask did leave a few tiny red blotches around my nose and cheeks which is expected since I do have sensitive skin, and this mask is NOT recommended for sensitive skin btw! But I sprayed a bit of Avene thermal spring water on my face and it helped curb the redness. To me the overall result was well worth that short period of discomfort of blotchiness and I also noticed that with use, my skin didn’t react as much as the first time I used the product. So to sum it up, best try a sample before purchase if you have very sensitive skin. ….and the answer to the million dollar question, would I repurchase? – A hundred times yes! This product works, and I would love to use it everyday and the only thing stopping me is that it’s only recommended to be used once a week. I purchased mine at Escentials Singapore at the Tangs beauty boutique, and is also available at Escentials at Paragon. December 13, 2013 December 13, 2013 by Bubbly Michelle22 Comments on Welcome! So it finally happened! After careful consideration and some encouragement from friends I decided to take the plunge and am now officially a beauty blogger! Some of you may already know me from Instagram, and don’t really need an introduction, but…. for those who are meeting me here on my blog for the very first time, let me give you a quick overview of who ‘Bubbly Michelle’ is and what I plan to post here! I am a fashion designer by profession and thoroughly enjoy messing around with colour and textures; getting creative with fabric is what I love! Apart from that, I LOVE photography and playing with makeup, so inevitably photographing makeup was the perfect pairing and my Instagram account ‘bubblymichelle’ was born and now, my blog! What you could expect to see on my blog would be, makeup reviews (mostly high end), new collection info, and swatches! I also plan to post skincare and haircare reviews, as well as the random rant! So if that’s what interests you, please subscribe.